What’s the catch? Cool sentence, right? somewhere straight out of the latest spies novel, the good guys have finally found a way to move forward, still they know, there may be a catch… It’s simply too good to be true… and I am not talking winning prize, I’m talking about this catch or double bind we sometimes create… with our mindset. Mindset is one of this very cognitive word, intangible. You can’t grab a mindset. You can’t draw a mindset. You can’t look at it. “the established set of attitudes held by someone”, and we can talk of the possibility of several mindsets working along side each other. In French, we have the world “mentalité”. It does not feel like an exact match, and it is not. “Mentalité” comes actually from the English “Mentality”, and ends up having three possible translations… mentality, outlook, mindset… It becomes even more interesting since we can found “mentalité” used in English as “The attitude of a person or group of people to the world and their conception of their place within it”, which is then expanded as “From French mentalité the quality or condition of that which is mental, modes of thought, beliefs, morals, etc., characteristic of a particular group, either from mentality or independently from mental + -ité”. Enough to get lost in a maze of meanings within the seven letters of this word MINDSET. It’s well known… words are wild beasts… and in the jungle of our thoughts, we can either tame them or be their slave. A great way to tame a word is to turn it into a conscious word. First step: take the word as an acronym and for each letter write something that automatically associate with it. Second step: identify what word(s) you may prefer/want to change. Ideally a conscious word should turn into a sentence easy to remember. A great example of a conscious word if FAIL, which became First Attempt In Learning. With this simple exercise we have now turned a “not always well received word” into a “great experience”, our FIRST ATTEMPT IN LEARNING something. Amazing, right? When I follow this process with MINDSET, I came up with “Movement /Inspiration /No limit /Decisions /Steps /Energy & Education /Time & Test. The idea next would be to refine this until I have one sentence out of it. For instance I am not sure of “No Limit” I like it, at the same time, as I write this post this morning, the word NOW is becoming stronger. From my first list of words, I have identify something I am not so happy with, I am re-focusing and rethinking my current mindset. In six months time I know I will have again something different, which is great, it’s growth and evolution. 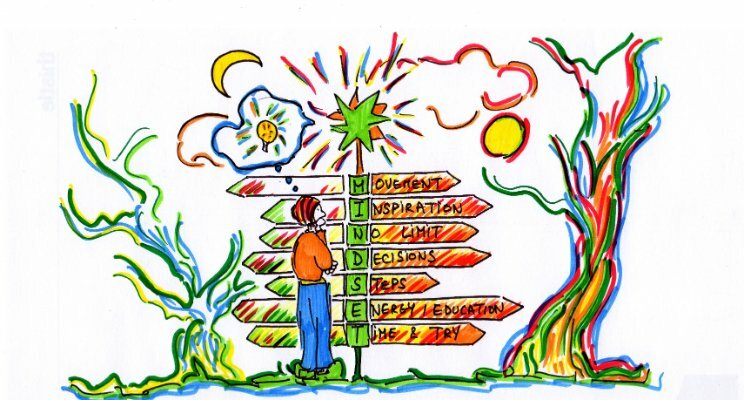 At my last “Discover your mindset” workshop , someone came up with the following conscious word: Motivated /Introverted /Neutrality /Diversity /Shyness & Spontaneity /Equality /Tedious. The word “tedious” is very interesting. It echoes this saying we often hear in sports “No pain, no gain”, and somewhere, it seems this person integrates that things/life have to be tedious. Let’s say now, that this person decides to change job to look for something she really enjoys. Hum… Can you see it? The double bind? The famous catch? Since this person assumes tedious is part of everything, she will find impossible to have a job she enjoys, as a job she enjoys won’t be tedious, hence won’t be possible in this person current mindset. Here it is, the catch! But a catch very easy to solve, and the first thing to do is ask this person “What do you think of tedious? Anything you would like to replace it with?”. If you want a quick discovery for yourself, do your own conscious word and send it to me via LinkedIn. I will send you back a short feedback in the form of one question for you to answer. Time to have fun, right?